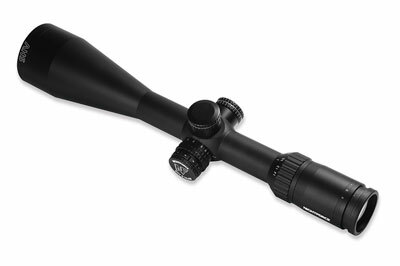 Nightforce SHV scopes were primarily introduced because the Nightforce riflescopes are not cheap. The NXS series rifle scopes from Nightforce are of military standard having precise tolerances and can withstand a lifetime of recoil. Moreover, they are being built from highest quality of materials and is therefore practically impossible to create such a world class product at ‘cheap’ price. To make available similar kind of quality product at affordable price, the company decided to bring in Nightforce SHV product. While manufacturing this product the company engineers geared down the ‘overbuilt’ features of NXS series that was originally built to withstand combat situations. Therefore, you can get almost NXS kind of experience with SHV but at an affordable price. This device comes with second focal plane, 4-14x magnification, 56mm objective diameter, 4x: 12.0mm/14x: 3.6mm exit pupil diameter, 4x: 7.3m/14x: 2.23m/@100 Yards/100 Meters FOV, 80-90mm eye relief, 100MOA elev. 70MOA wind and 27.3Mil elev. 19.1Mil wind internal adjustment range, .250MOA, 30mm tube diameter, 43mm ocular diameter, 147mm mounting length, and optional illumination. Nightforce 4-14 x 56 SHV essentially cuts your cost and not corners. Buy Nightforce SHV to experience the best at affordable price.